So who has the biggest September 2014 fashion issue in the magazine world? Well, the ad page numbers are in and let's just say the winner is as expected. We've got the whole 2014 lineup here, starting with Vogue - but, of course. Looks like we'll all be needing to work on our arm muscles to carry these bad boys from curb to car. Those are some hefty ad sales! Here's hoping the magazines choose to give us some meaty content as well as there's nothing worse than an ad only glossy flip. This all being said, it isn't all happy times for each and every magazine listed. 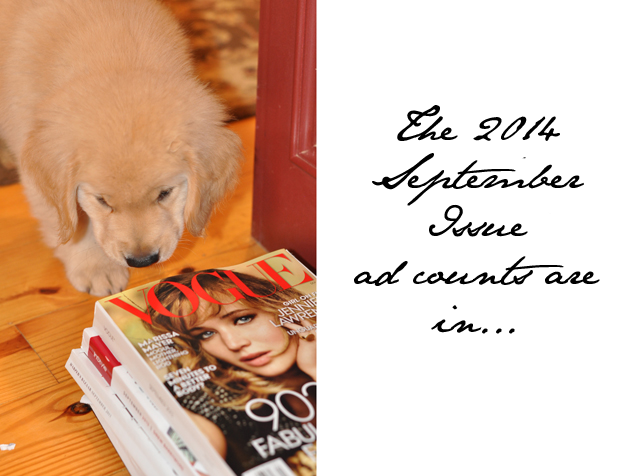 While the ad counts are mostly on the rise, there were several publications, including Vogue, reporting a drop in ad sales in comparison to 2013. While the drops are not massive in scale, they are perhaps a growing indication of a diversification of media spends. Vogue was quick to report to WWD that while their print ad sales are down, their digital revenue has increased 31 percent. It's an ever-changing world in which we're living, if I may be so bold as to borrow a line from Paul McCartney.